Mieji-juku flourished, facing the “Goudo ferryboat” on Nagara River and “Roku ferryboat”on Nagara River and “Roku ferryboat” on Ibi River. In Roku is “Ozu Koen”, related to Imperial Princess Kazunomiya. Mie-ji, the name of the area, originates from “Mie-ji Temple”, which was built in 719 with the eleven-faced-Kannon as the principal object of worship. The current post station forms an L shape with Mie-ji Temple in the middle; the honjin ruin was also built here. In this portion of the course, the Nakasendo passes in a westward direction to Mt. Ibuki. You will proceed into the solemn “Ibuki-oroshi.” The flow of Ibi River used to be west of Roku village, but it changed to the current flow due to river improvement in the Taisho Era and Roku village became located on the opposite side of Ibi River. In Roku is “Ozu Koen” related to Imperial Princess Kazunomiya. 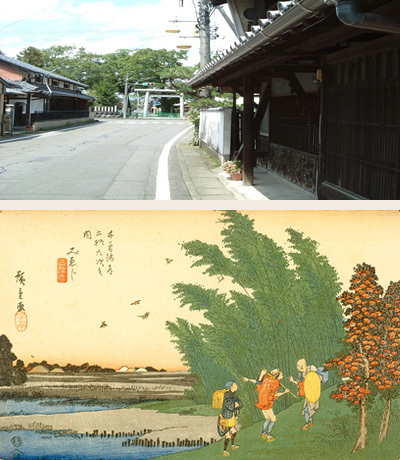 Yanagihara-no-Ichiri Zuka used to be located near Shinmei-gu Shrine on the opposite side of Hiranoi River, which was unusually far from the Nakasendo. The Nakasendo takes a winding route around the border between Godo-Town and Ogaki City, and gives us feel for the atmosphere of ancient times although there are very few remains left.